A couple days ago, Volkswagen teased an image teasing a new concept car they’ll reveal at next month’s CES, and it sure seems like it’s going to be a new Microbus. A new electric microbus. I’d like to pretend it’s because Volkswagen’s CEO reads Jalopnik. Specifically, read something here last month. Of course, I’d have to be delusional to think that VW read my piece suggesting their best way out of their current mess and the best way back into people’s good graces would be with a new electric Microbus and then spent a hurried month putting one together. That’s ridiculous. What I don’t think is ridiculous is the fundamental idea, still, since VW clearly was heading in this direction long before I (and a number of others) started suggesting that hey, wouldn’t that be cool. 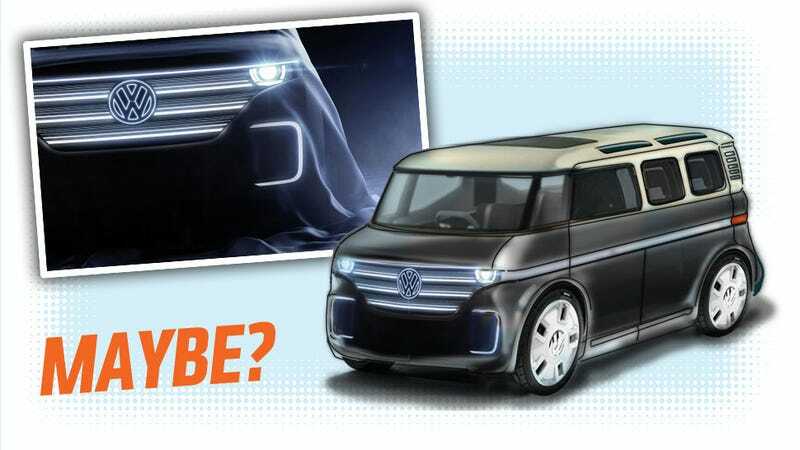 This teaser image isn’t much to go on, but it does appear to show a van-like front end (meaning, a fairly stubby hood) with (truncated) round lights, and a show-car-indulgent glowing grille area that suggests a ‘V’ shape. I personally think they could have gone a little closer to the original on that front end, but I’m sure they have lots of good reasons for wanted to push for something new. I think the main body may resemble an enlarged version of the VW UP! bus concept that was shown in the recent past, but scaled closer to conventional, three-row minivan size. If an electric drivetrain will be used, a motor may be mounted at the front axle, and the considerable floor space could be used for batteries, as Tesla does, which would keep the box-like body very open and roomy, an important trait for a Microbus. The D-pillar will be thick, and I thought maybe they’d hint at the old vents with some lights, perhaps that could show charge state as the car is charging — many EVs have external charging-state indicators, after all. I think a new Microbus would need a strong beltline and be very able to work in two-tone, a hallmark of the original Type IIs. Since this is a concept-guess, I figure maybe they’ll continue that illuminated theme down some side beltline, a feature which likely wouldn’t make it to production, like the glowing grille. Side windows in the roof, suggesting the old 21-window Buses, would also be a great identity-marker and a pleasant feature on its own. The Microbus would need sliding rear doors on both sides, a good-sized rear hatch, and a very flexible interior. An electric version makes the most sense for Volkswagen at this moment, PR-wise, since for them, the only good emissions are no emissions. But I think a combustion-engine version would make sense as well, since the electric minivan market is still pretty niche compared to the overall minivan market, which is ripe for an interesting new entry to come in and shake things up. So, before I ask what you think, keep in mind this is a quick sketch and, while I draw and design, I’m by no means a trained auto designer. One of those could do this far better than me. With that said, I’m curious to hear how plausible we think this could be. I hope they pull this off well. The world is always made better with interesting new small vans, after all.